How quick can you be to fire off your gun and kill the other person? Find out in this bloody and fun western shooter, Gun Blood! Get your guns ready! 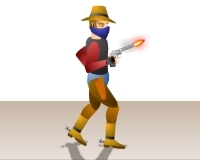 Tell us what you think about Gun Blood: Cowboy Shooting Game. Leave a review or share a tip.